TVB Fairchild Fans Party, hosted by Fairchild TV in collaboration with TVB, featured a new combination of prominent and promising artistes this time, including the charismatic Ben Wong and Raymond Wong, together with the beautiful and beloved Grace Chan and Rosina Lam. 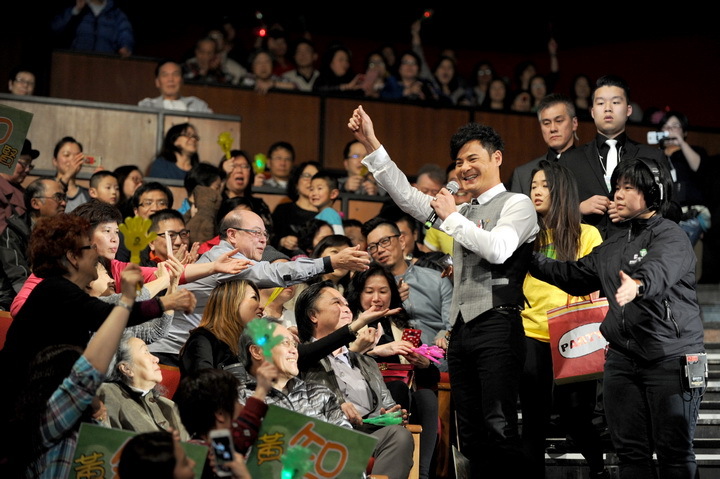 Along with the beautiful notes of their drama theme songs, the four popular stars each made an entrance from the audience section, handing out TVB souvenirs as they stepped up the stage. The most anticipated event TVB Fairchild Fans Party brought a new cast of hottest artists to Toronto this year. Including the charismatic Ben Wong and Raymond Wong, along with the beautiful and beloved Grace Chan and Rosina Lam, sharing their first ever Fans Party event with Fairchild audiences. The event is organized by Fairchild TV, the four artists spent a fun-filled night together with their fans on April 9th at John Bassett Theater. Fairchild Television has invited a new lineup of prominent and promising artistes, including the charismatic Ben Wong and Raymond Wong, along with the beautiful and beloved Grace Chan and Rosina Lam, to join the annual TVB Fairchild Fans Party. The four stars made a grand entrance into the Fans Party press conference shortly after their arrival in Vancouver to meet up with hundreds of fans who had stationed at Aberdeen Centre hours in advance. Fairchild TV broadcasted the entire press conference LIVE on Facebook, so fans could catch all the actions of this welcoming party for the four popular stars. The most anticipated event TVB Fairchild Fans Party is bringing the hottest artists to Toronto this year including the charismatic Ben Wong and Raymond Wong, along with the beautiful and beloved Grace Chan and Rosina Lam, to join the annual TVB Fairchild Fans Party. Many fans gathered at First Markham Place hours in advance to secure a prime spot to meet their favorite artists.